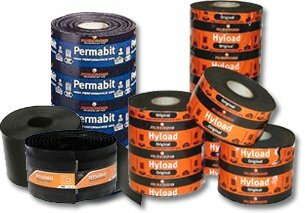 Damp Proof Course and Damp Proof Membrane are all available from Building Materials Direct along with other construction membranes for use in various applications. 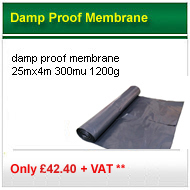 Damp Proof Membrane generally comes in 25mx4m rolls and the most commonly used are the 250mu (1000gauge) and the 300mu (1200gauge) in blue and black although there are other different thicknesses manufactured so if you require something different give us a call and we endeavor to source it for you. There are many types of DPC's in the Building Materials Direct Range from standard polythene DPC, Insulated DPC, Methane and Radon Resistant DPC through to the High Performance DPC's which give the added benefit of being tough and durable, good flexibility at low temperatures and have excellent performance under high compressive loads. These DPC's come from top manufacturers such as Ruberoid with their Hyload range and Visqueen Building Products with their Zedex range, so you know when you buy From Building Materials Direct you are buying a top quality product. DPC's in the high performance range are also used in the manufacture of preformed cavity trays and cloaks these are also available on request (please note drawings will be required to enable correct product to be supplied). Vapour control barriers are also available and are used to omit the risk of interstitial condensation within a structure as well as improving the general air tightness of the building these Vapour Barriers restrict the passage of warm, moist air from within the building from permeating into the structure or the roof. Building Materials Direct are also suppliers of a range of tanking membranes for use in cellar conversions and swimming pools, just give our sales office a call with what you require and they will be only too pleased to help. The Building Materials Direct damp proof course , damp proof membrane and construction membrane range covers everything you could require for your selfbuild or DIY project. This includes Gas, Hydrocarbon and Radon Resistant Membranes which are more and more common these days with the ever increasing green issues the use of brownfield building land is more common but does sometimes come with its pitfalls i.e. ground contamination giving rise for the need of this type of membrane.